This animation shows Jupiter's moon Io during a complete rotation. 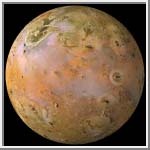 It was created from A. Tayfun Oner's Galileo map of Io with Color extracted from the USGS Voyager map. This animation is Copyrighted © 1998 by Calvin J. Hamilton. Any commercial/for-profit use of this animation needs to be addressed to Calvin J. Hamilton. High-resolution animations can be generated upon request.